A picture showing diary cows. 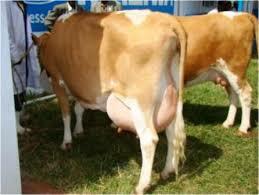 Milk production in the country has reportedly increased. Courtesy photo. Milk production has continued to grow at a rate of 8-10 per cent and is set for continued growth according to information from Uganda Dairy Development Authority. Ms Pamela Ejang the communications officer at the Dairy Development Authority, said milk production stood at 2.2 billion litres by the end of 2016 up from 1.5 billion litres in 2010. Government efforts have mainly focused on improving and supporting dairy sector players to access markets, but also to add value to milk. The above started with liberalization of the dairy sub-sector, the rehabilitation and subsequent divesture of Dairy Corporation, rehabilitation of rural milk collection centres and providing milk coolers to dairy farmers’ groups, among other interventions. The above efforts have indeed paid off. Ms Ejang says about 80 per cent of the total national milk produced is marketed and 20 per cent consumed by the farming households. “Only 33 per cent of the marketed milk is processed and 67 per cent is marketed raw, the total value of marketed milk was estimated at $752 million (2016),” she says. “Through government and development partners’ efforts, small holder dairy farmers have been encouraged to form cooperatives and benefit from economies of scale and increased market access,” she adds. A man milks a cow. Milk production in the country has increased according to statistics. Courtesy photo. Currently there are 11 unions and 219 active dairy farmers’ cooperatives in the country. There has been growth in cold chain infrastructure and currently, there are 355 milk collection centres with a total chilling capacity of 1,547,454 litres. Raw milk is now transported in insulated milk road tankers from the collection centres to processing plants and urban milk retail outlets. Currently there are 243 certified milk road tankers with a total carrying capacity of 1.4 million litres. The installed dairy processing capacity stands at 1.9 million litres per day. Ms Ejang adds that the value of exported milk and dairy products is estimated at at $85 million to date which reflects good performance against dairy imports that stood at only USD 5.2 million (2016). She says the value is projected to rise owing to the increased demand for milk and milk products in the region and beyond. The dairy products that are currently processed in Uganda include; milk powder, UHT milk, pasteurised milk, yoghurt, butter, ice cream, cheese and Ghee for the local market. UHT milk, ghee, casein, whey proteins, butter oil on the other hand are exported within the region (Kenya, Rwanda Burundi, DR Congo, South Sudan) and to the Middle East. Ms Ejang says although the per capita consumption of milk (kg/ year) has increased over the last ten years from 40 litres per annum in 2001 to 60 litres as of 2016, it is still below 200 litres per person per annum as recommended by WHO/FAO. “It is for this reason that we celebrate the June Dairy month under the theme “Adopting Technologies for Enhanced Milk Production and Consumption”. The theme is a call to all Ugandans to take up dairy farming as a business using the available technologies, produce more milk and tap into the available market for improvement of house hold income. The theme is also a call to all Ugandans to consume more milk and harness the nutritional benefits derived from milk consumption,” she adds. June Dairy Month is an annual “Dairy Month” celebrated worldwide to pay tribute to contributions of dairy farmers, dairy processors, traders, and their families who work hard every day to provide fresh, whole some milk and milk products for everyone to enjoy.